‘Based on the New York Times bestseller, WONDER tells the incredibly inspiring and heartwarming story of August Pullman, a boy with facial differences who enters fifth grade, attending a mainstream elementary school for the first time. After sharing with you that some of those in the craniofacial syndrome community had issues with the film I was a little hesitant about seeing the movie which opened today. 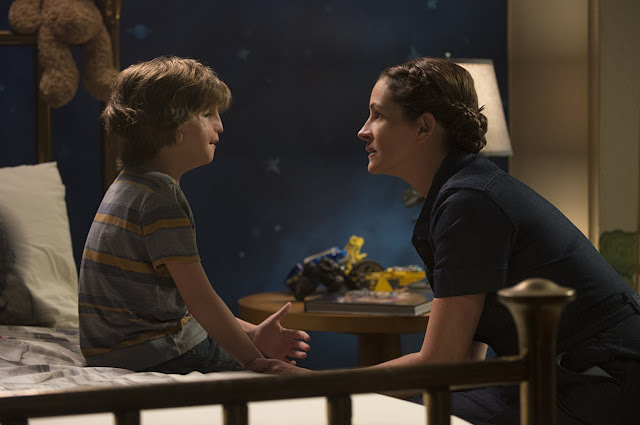 Based on the book by R.J. Palacio, August (Auggie) Pullman is played by young actor Jacob Tremblay (he was remarkable in Room), with the help of prosthetics and makeup. 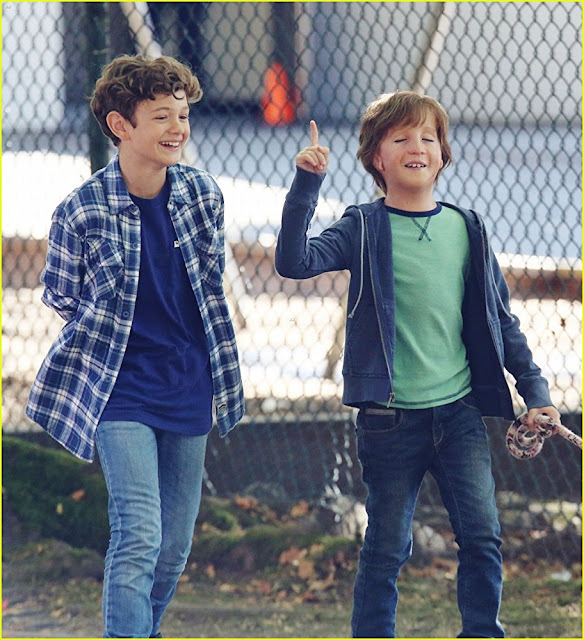 Some of the complaints I read expressed regret that Auggie wasn’t played by a real 10 year old boy who had the syndrome themselves who couldn’t take off what amounts to a mask. We heard a similar response to the casting of Sam Claflin as the paraplegic Will Traynor in Me Before You. Why cast an able actor to play a disabled person? I understand the sentiment and feel sorry that it feels insulting but those complaints don’t take into account how acting really is an art, it’s a skill that takes talent. Extraordinary talent if the film is to work. 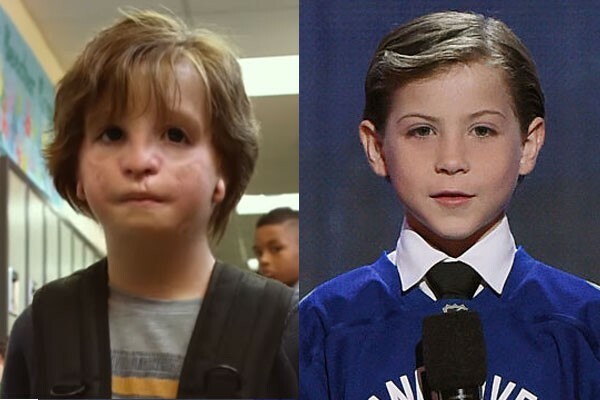 I don’t know if the producers or director Steven Chbosky searched for a young boy who both had the syndrome and the acting ability, but he would be quite a find. What I think matters most is the light that Wonder shines on the syndrome, and in doing so increases our understanding of what those who have it, go through. As Auggie, Tremblay breaks your heart with his honest portrayal of a brave little boy challenging himself to break out from behind his self imposed mask, the helmet that protects him from the stares and cruelty of children and others. The book was meant for the young and the movie similarly slanted, delivers a ‘be kind’ message without falling into uncool, preach-y territory. Julia Roberts—who isn’t actually of hispanic descent as the mother in the book is, another complaint—plays Isabella, Jacob’s understandably worried and protective mom. She brings star power to the movie, and star power is what gets movies green lit. ‘‘I hope they’re nice to him’’ she says on his first day of middle school, while we all know they won’t be. At least, not at first. Owen Wilson as his dad is funny and adorable and endearing as a man who takes a back seat to his wife. 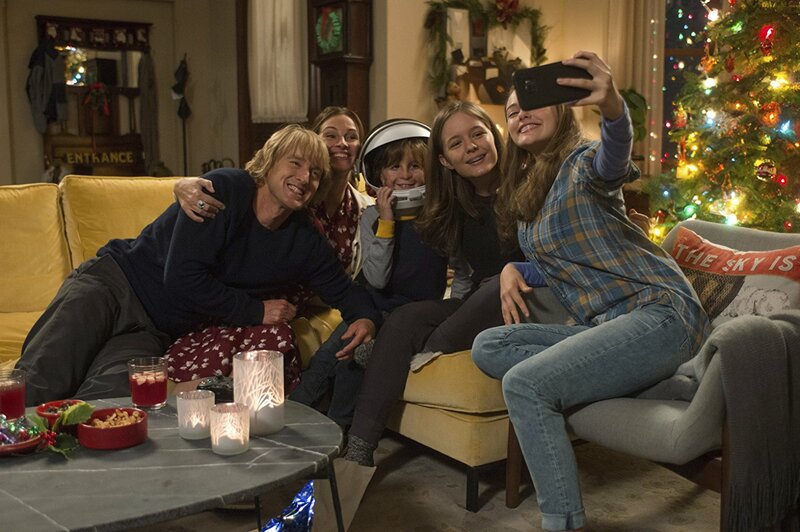 In the Pullman family, it’s Mother Knows Best, not father, although dad does pull off a couple of genius moves, one which has to do with Auggie’s helmet. New-to-me Izabela Vidovic is lovely as Auggie’s sister Via who tells us Auggie is the son/sun and the rest of the family revolves around him. An issue many kids with disabled siblings understand all too well. 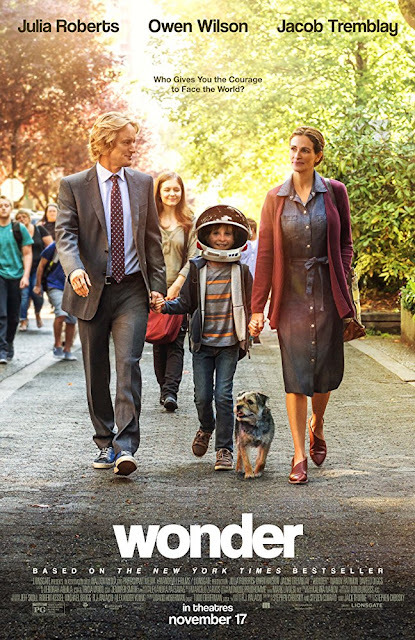 As you might expect, the story begins with Auggie feeling rejected by his classmates who frankly haven’t seen anyone like him before, and by the end of the movie, due to his persistence and the kindness of a few, he’s embraced and loved by all. That’s not a spoiler, you knew that, right? How could a heart-warming movie for kids end any other way? The thing is, Wonder spreads an important message, when you have a choice, Be Kind. For me, it echoes my own beliefs, not in a particular religion but in the practice of following the Golden Rule. I hope plenty of kids have a chance to see this movie in their formative years, to help them understand that they will encounter people in their lives who will be different than them. People who may be disabled, physically or mentally, or perhaps people who look different in terms of their skin color or who may be from a different country, people who may ‘speak funny’ or wear strange clothing. People who scare us because we don’t know them, and the unknown is always scary. And when they encounter those people that seem scary at first, to take a breath, be brave and be kind. End of lecture but one note. Every year studios spend gazillions of dollars sending out DVDs to industry award voters. My husband receives them from the DGA, thousands of actors receive them from the Academy, so why not send them out to schools around the country and the world. Really spread the Be Kind message. Okay, now the lecture really is over. In addition to Julia Roberts, Owen Wilson and the film’s young star, the cast of Wonder includes Mandy Patinkon as the caring school principal, Daveed Diggs—Thomas Jefferson/Marquis de Lafayette in the original Broadway cast of Hamilton—as Auggie’s gifted teacher and the acclaimed Sonia Braga in a teensy part as the kids grandma.